As the Trump Administration prepares for take-off, American businesses are cautiously optimistic that the fabled real estate developer will pursue business-friendly policies. But some business sectors are more optimistic than others. Airlines and the travel industry in general, for example, are hoping that Trump's tirades against Mexico, Cuba, and other nations don't restrict travel to those countries. Southwest Airlines CEO Gary Kelly expressed concern at an event in Tampa about travel to Cuba, a fast-growing market for Southwest and other carriers. 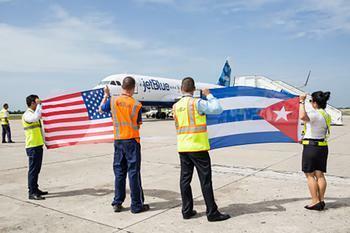 "Those flights have high demand both from the U.S. and from Cuba and obviously we're hopeful that we can continue to operate them," Kelly said, according to a report in the Tampa Bay Times. "If the government, for other reasons decides that that's not possible obviously we'll obey the law but we're hoping that's not the case." Southwest is one of several U.S. airlines to begin flying to Cuba under relaxed policies implemented by the Obama Administration, flying a Havana-Tampa route for the last month. Trump has indicated he may take a harsher approach to relations with the island nation, as well as other Central and South American countries that are on Southwest's radar. Kelly noted that while Southwest remains a primarily domestic carrier, it has been adding flights to Mexico, Central America, and the Caribbean through a new five-gate international terminal it's building at Fort Lauderdale-Hollywood International Airport. Trump was uncharacteristically silent last week when the Obama White House reversed the decades-old "west foot/dry foot" policy that allowed any Cuban who managed to make it to U.S. shores to remain here legally, although he had said last year that the policy was "not fair." Although the decision was sudden, there was general agreement that either Congress or Trump would have revoked the special treatment that Cuban refugees have long enjoyed. Despite the continuing wrangling over Cuban immigration and trade policy, tourism to the long-isolated country is booming, with a record 4 million visitors last year. With new cruise and airline routes now operating, Cuban tourism officials are expecting at least 100,000 more visitors this year. That could, of course, all change in a tweet. Trump has warned he may scrap the whole Cuba normalization process started by Obama in December 2014 unless the U.S. gets a "better deal."